DIAL: Black glossy dial with 2 registers and radium hour markers. Minutes & tachymeter scales printed in white. White radium filled hour/minutes 'cathedral' hands. CASE: 37mm, Stainless Steel step case with snap back. CONDITION REPORT: The Dial and hands are in excellent condition and the original radium lume (geiger & UV both OK) is in excellent condition as well and still intact. The glossy surface of the dial has no major flaws and retains its original shine. The case is unpolished and only very slight signs of wear, overall excellent. 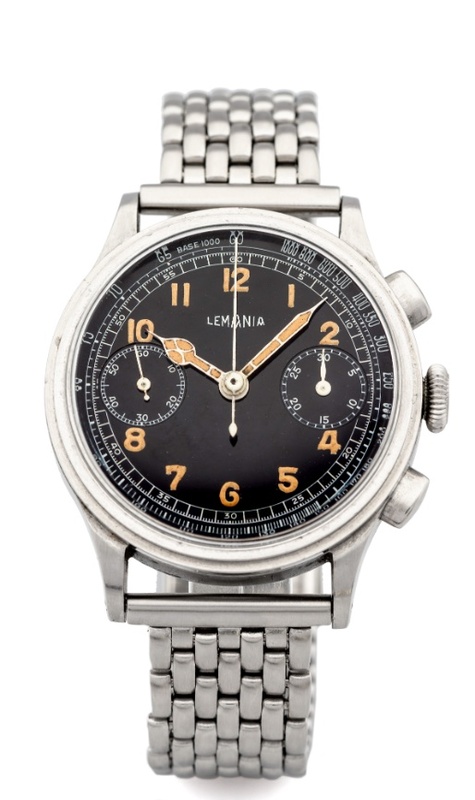 Finding these radium glossy black dial chronographs in such excellent condition is exceedingly difficult adding to the rarity of this example.